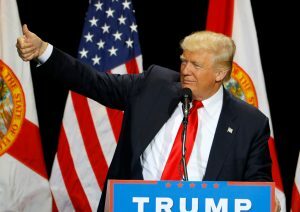 TAMPA, Florida — Campaigning in the crucial battleground state of Florida, Donald Trump bashed Democrats and Republicans alike Saturday, from Hillary Clinton to former Republican presidential nominee Mitt Romney on the right. Addressing a crowd of thousands at the Tampa Convention Center, Trump tore into “Crooked Hillary,” as he calls his likely general election opponent, over her use of a private email server while secretary of state. He called Romney a “stone, cold loser” for not backing him as the presumptive Republican nominee. Trump said the Republican Party “has got to get their act together, come together to win.” He slammed Republicans in the U.S. Senate who oppose his candidacy. He spoke confidently of his own ability to win the presidency, but warned that Republican seats in the House and Senate could be at risk if Republicans don’t rally behind him. Trump was introduced by Florida’s top Republicans, Gov. Rick Scott and Attorney General Pam Bondi. Trump, at one point, asked the crowd to shout out names of potential running mates. Former House Speaker Newt Gingrich, Alabama Sen. Jeff Sessions and former Secretary of State Condoleezza Rice, were among the names he repeated. Toward the end of his speech, Trump supporters broke into a chorus of “Happy Birthday.” He turns 70-years old on June 14. The Tampa rally is Trump’s second since the end of the primary season. He is scheduled to hold another rally later Saturday in Pittsburgh.